I’m a sucker for a bargain and free is as good as it gets. But if my Kindle experience had taught me anything it’s that books are free for a reason. Unless the copyright has expired and they’re classics, I think I’m better off not even going to the trouble of downloading them. There is a lot of rubbish out there, pasted between two covers and sold in the name of fiction. That said, I’ve had a lot more luck with books in translation. I make a point of visiting bookshops when I travel and doing my best to get hold of local authors in translation. 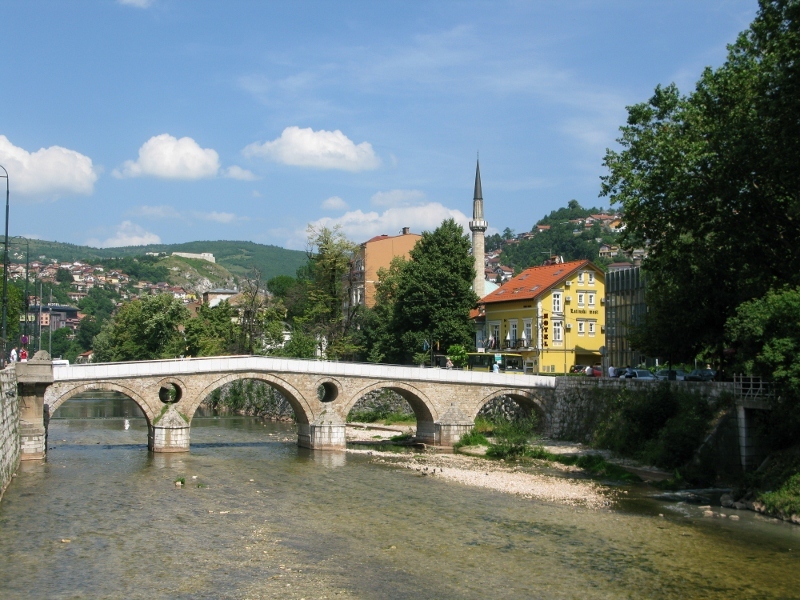 It tells the story of a love affair during the Bosnian War between 1992 and 1996, an era still very much in living memory. Both the lead characters are journalists – she’s married, he isn’t. 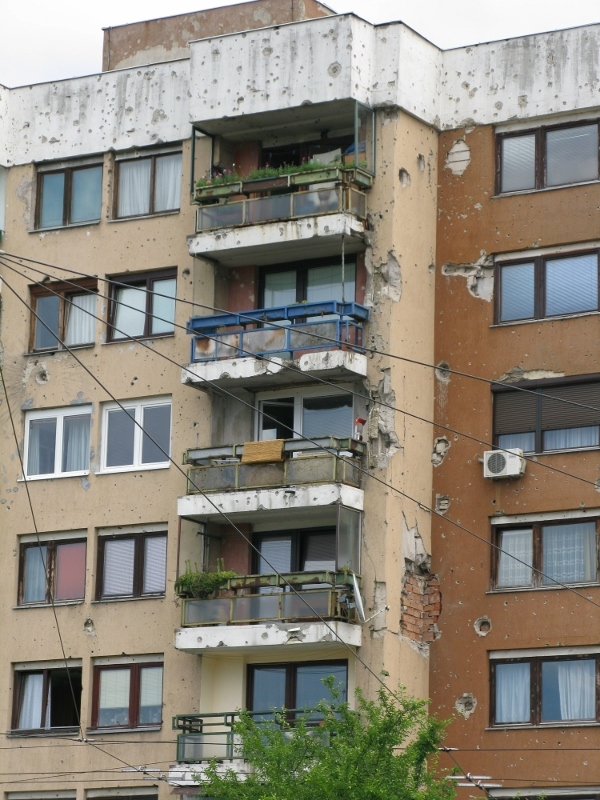 I know very little about what happened during that time and my paltry effort to understand it all while I visited Sarajevo a couple of year ago was drowned in the realisation that greater minds than mine have yet to make any sense of what happened. 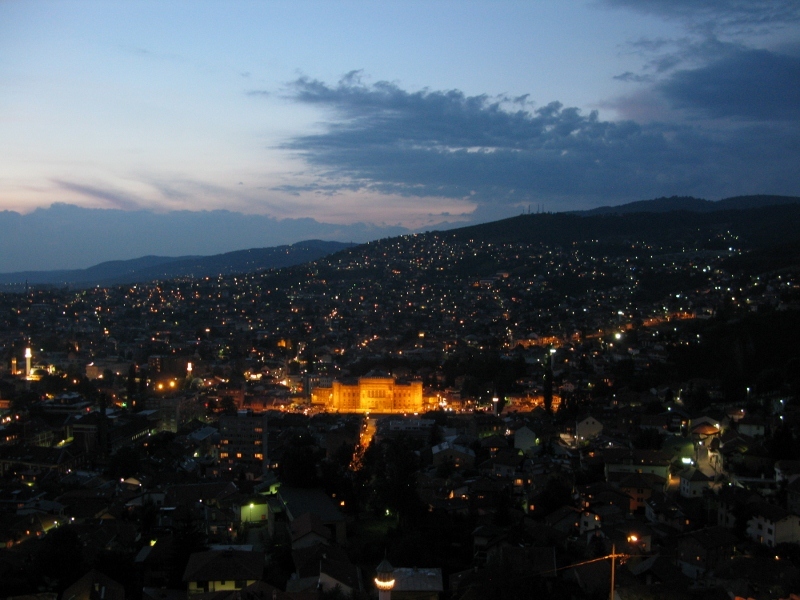 While I prefer my love stories not to be so blatantly branded, I have a thing about Sarajevo – it’s a city that left an indelible impression on me, one I’d like to spend more time in. That said, the book has languished amidst many other not-yet-reads for months and it’s only lately that I finally got around to reading it. It ticks all the irritants I find with translated text. Sentence structure isn’t great at times; phrasing is off; colloquialisms don’t quite work as well as they might; and the proofreader seems to have thrown in the towel about half-way in. mmmmm… that goes for a lot of English originals, too. And yet I was sucked in from the start. The graphic depiction of the atrocities on all sides, situated as they are in everyday relationships, is unreal. If only 1% of it is true, or even based on something approaching fact, that’s too much. I had some idea of what went on but could never have imagined it so bad. And yes, I know it’s a work of fiction, but even fiction has its base in something. It’s clear which side the author was on but even that didn’t take from the story. The reviews on Goodreads suggest that Kulin’s depiction of the politics of the day was well researched and accurate (if a little biased at times but I wouldn’t know). If you’re travelling to the region and are interested in its all too recent history, it’s worth a read. Kulin’s book is a stark reminder for me of how cosy my own world is; of how blessed I am to have had the upbringing I’ve had; and how little I know of what happens outside my immediate environment. From my current vantage point, I can’t begin to imagine what I’d have done were I born into that region, and lived through that war – but then again, I may well have done what everyone did – tried my damnedest to survive. Some people are good at spotting celebrities; others are good at spotting bargains. Me? I can spot a cemetery from miles away. And in a city I’ve never been to, wandering through a local cemetery is high of my list of things to do. 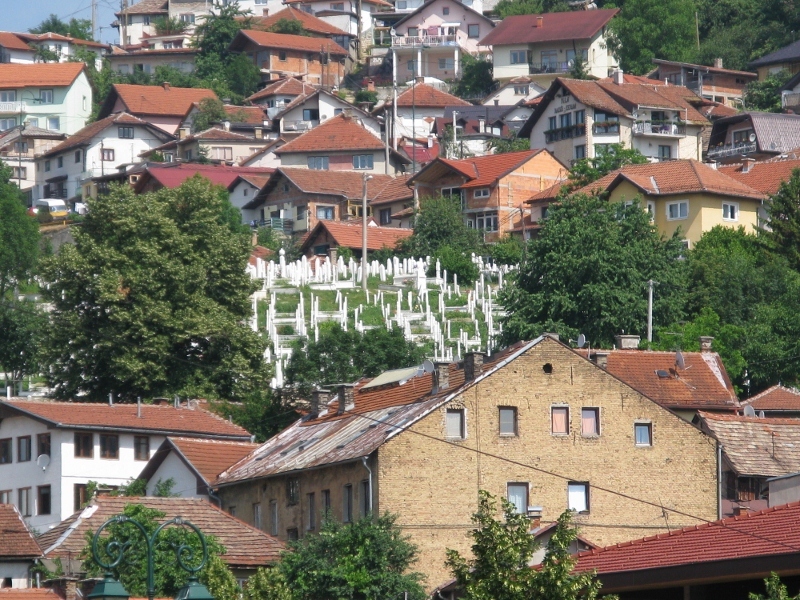 Walking alongside the Miljacka River, surrounded by the Dinaric Alps, I happened to glance up and spot the Alifakovac Cemetery high on the hillside, nestled amidst the houses of Stari Grad. When I tried to find out more about it, I discovered that the neighbouring houses, built long after the cemetery itself first opened its grounds, were built in a way that wouldn’t block each other’s view and sunlight. Those city planners should clone themselves and outsource their talent to the rest of the world. This Moslem cemetery dates back to the 15th century and is known for its Ottoman Turbe (or dome-like tombstones posted on four pillars). Here, many respected citizens lie beside travellers. 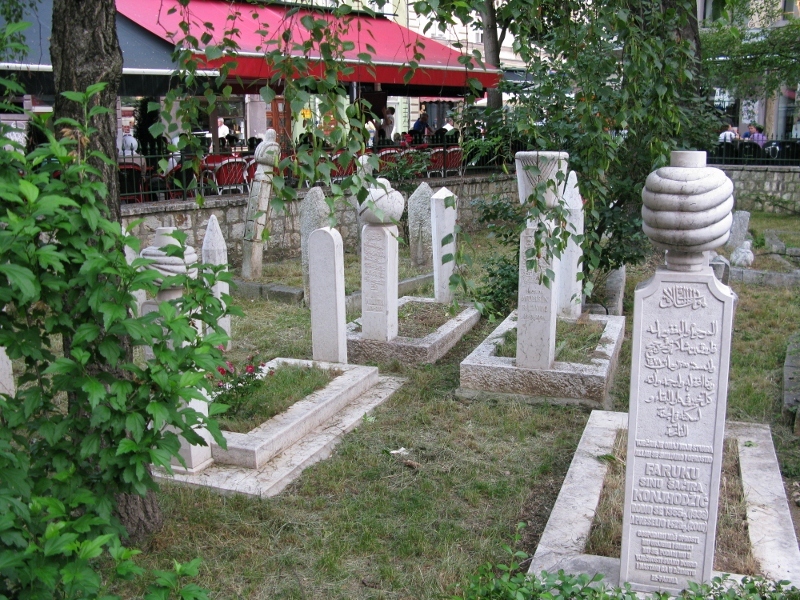 The cemetery is also a Musafirsko cemetery (from the Turkish word musafir or traveller) where visitors who die while visiting the city are buried. There’s no such thing as shipping bodies home. 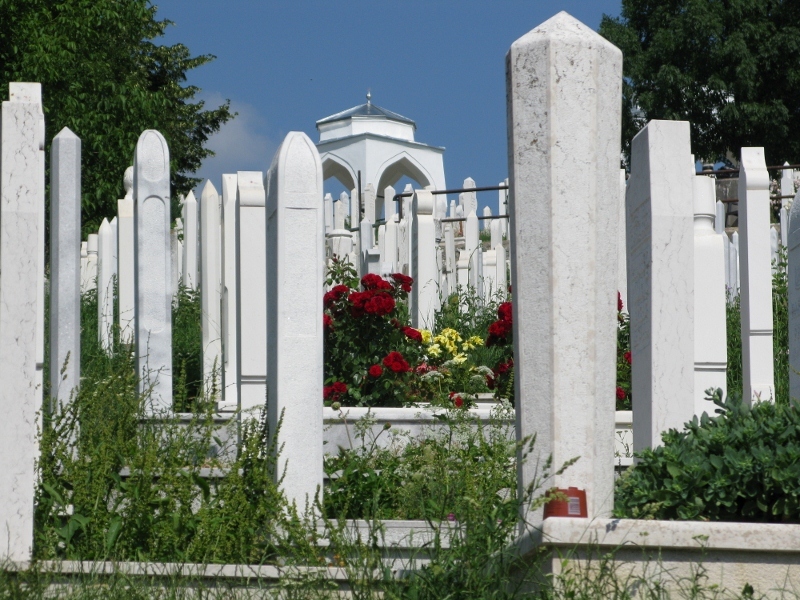 Because of the rules about a quick burial, it’s traditional to bury a Muslim where they die. The stark white tombstones brought to mind a military graveyard, like the one at St Avold in France. The clean lines and lack of ornamentation that is so visible in Christian and Jewish cemeteries I’ve visited gave this cemetery a different feel. Cars drive through but yet as a pedestrian, I found it difficult to wander and I wondered briefly how much clambering would have to be done to get to a particular grave. And do people actually ever visit? There was a marked absence of flowers and candles and the other accoutrements that adorn Christian burial sites. I found this strangely relaxing. Unlike the cemetery in Zagreb, where many of Croatia’s famous sculptors have their work still on show, Alifakovac Cemetery has few monuments of note. Simple inscriptions mark narrow white pillars. Bodies are interred on their right side, facing Mecca, preferably not inside a coffin. I was curious to know more, so I Googled and found this: There is some debate about whether women can visit the grave of a loved one to remember him. While some Muslims say that this is forbidden, others think it’s OK to occasionally visit the grave site to remember the deceased and meditate on mortality. There was no one at the cemetery the day I visited. No one but me. Down in the old town, nestled between cafés and restaurants lies another cemetery. It seemed strange to sit and drink a coffee within reach of a headstone but I was the only one who appeared to be remotely bothered. I found this juxapositioning of life and death a little disturbing and couldn’t quite put my finger on why. Perhaps it was a lack of reverence for the dead. Or the complete, unquestioned acceptance of the role of death in life. Or simply the incongruity of the tombstones and the canopies. 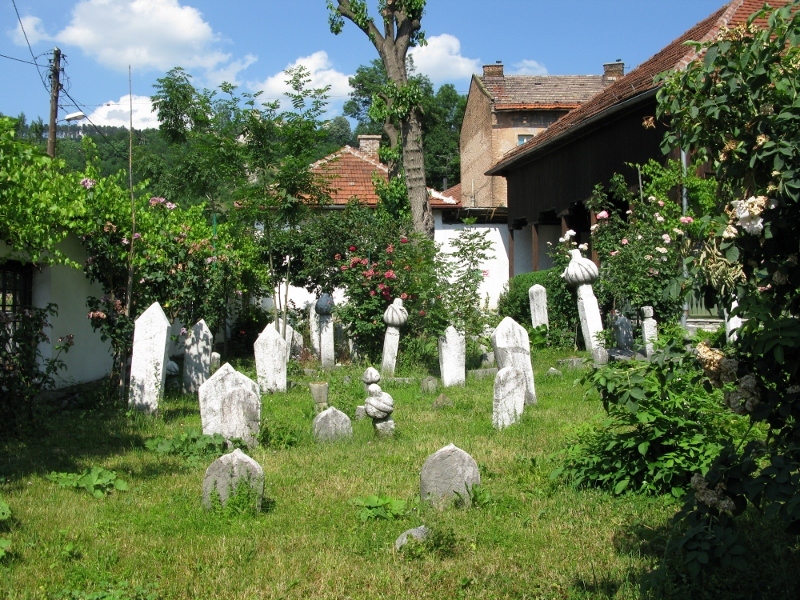 In the grounds of the Vekil Harč Mustafa mosque are more tombstones. A few weeks ago, during a visit to Ráckeve in Hungary, I came across Prince Eugene of Savoy. And here, in Sarajevo, I found him again. 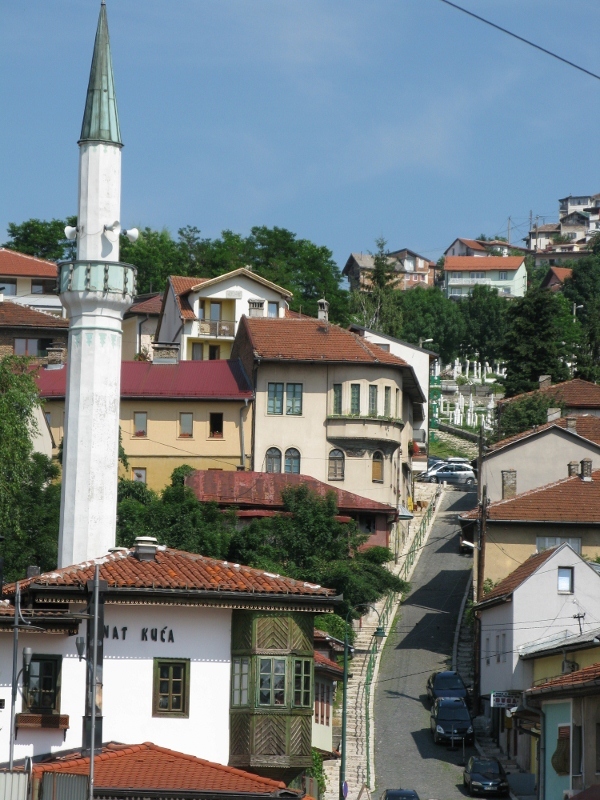 Following his campaign in 1679, a great fire swept through Sarajevo and this mosque was damaged, but quickly repaired. 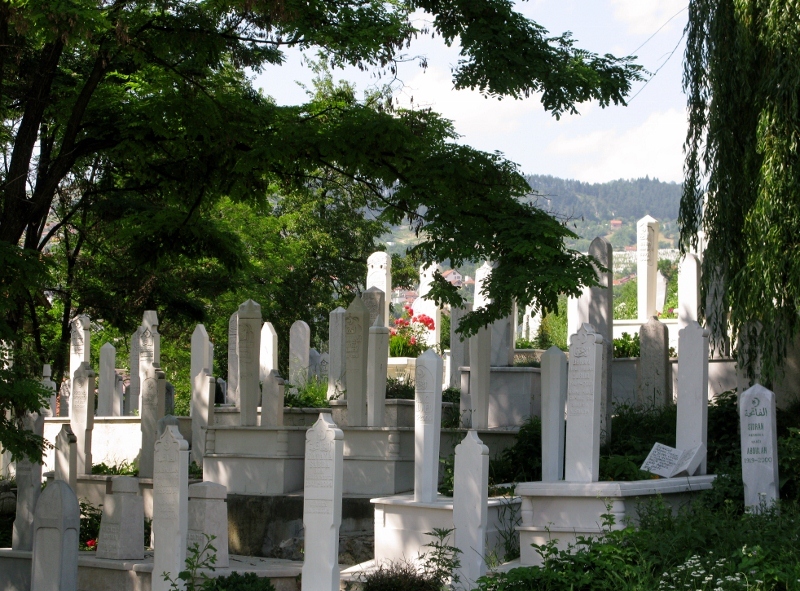 The tombstones we see here are known as nišan tombstones. 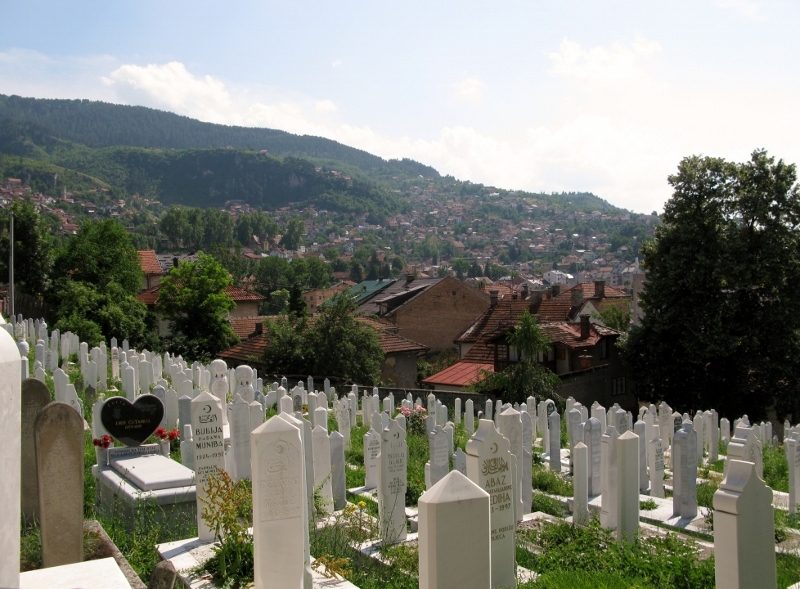 Sarajevo seems to be at home with death. Perhaps its tumultuous history has a lot to do with this acceptance. 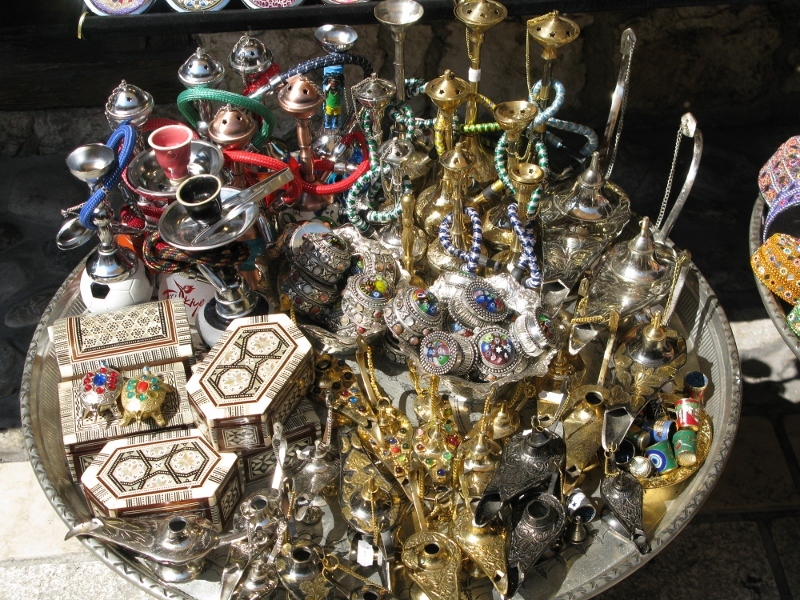 As for me – I’m torn between the Muslim simplicity and the monuments favoured by Christians and Jews. 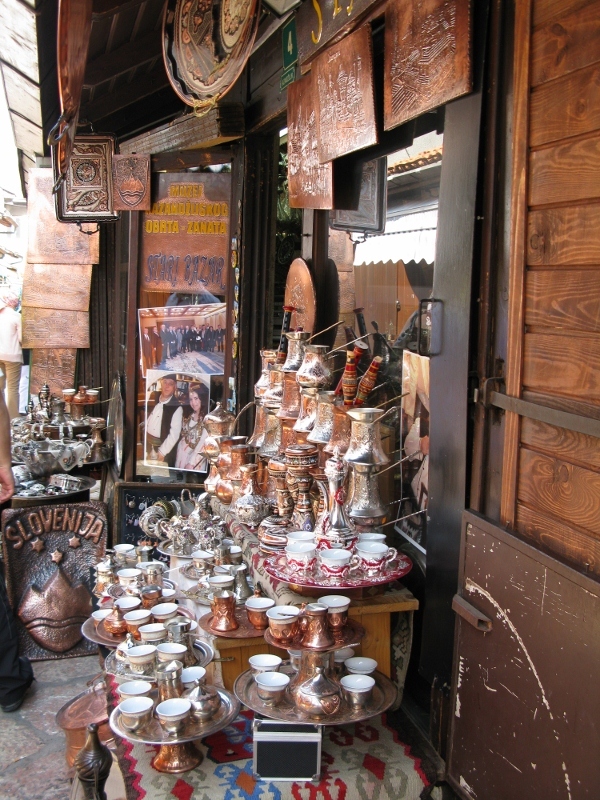 A mate of mine once told me that you know when you hit the Balkans: the coffee gets good. Finding myself in the old town market in Sarajevo last Sunday afternoon, I sat down beside this old woman at a table outside a café. I asked the lady of the house for a coffee with milk. She shook her head. I asked for a Nescafé – I knew I wasn’t in Serbia but I was close enough to hope that the Nescafé concept might have leaked over the border. She shook her head again. Wine? Shake. Beer? Shake. She said something and at a complete loss for something to say, I nodded. This was a one-item menu. 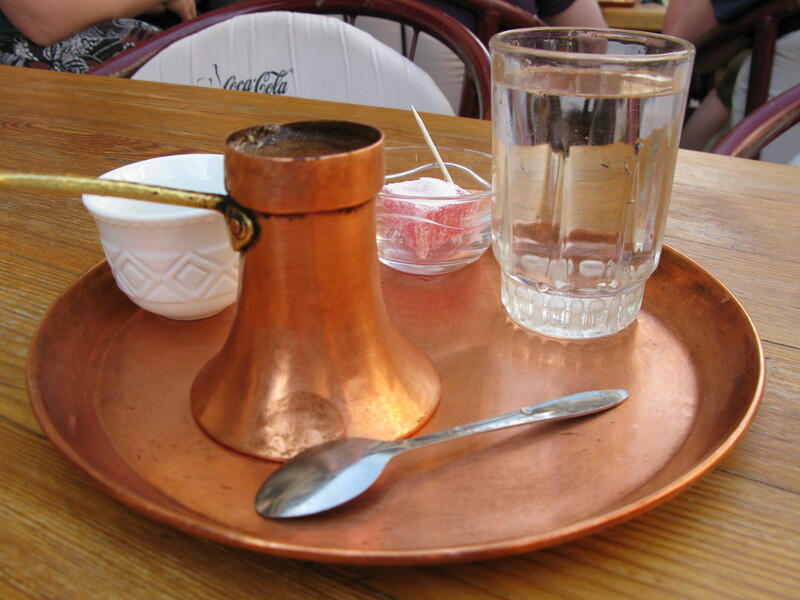 I got a traditional Turkish coffee served with two cubes of sugar and a square of Turkish Delight. The coffee looked like mud. Something that reminded me of pond scum floated on the top. It poured like treacle, and the word ‘oleaginous’ came to mind. I don’t take sugar – and I never have coffee without milk. 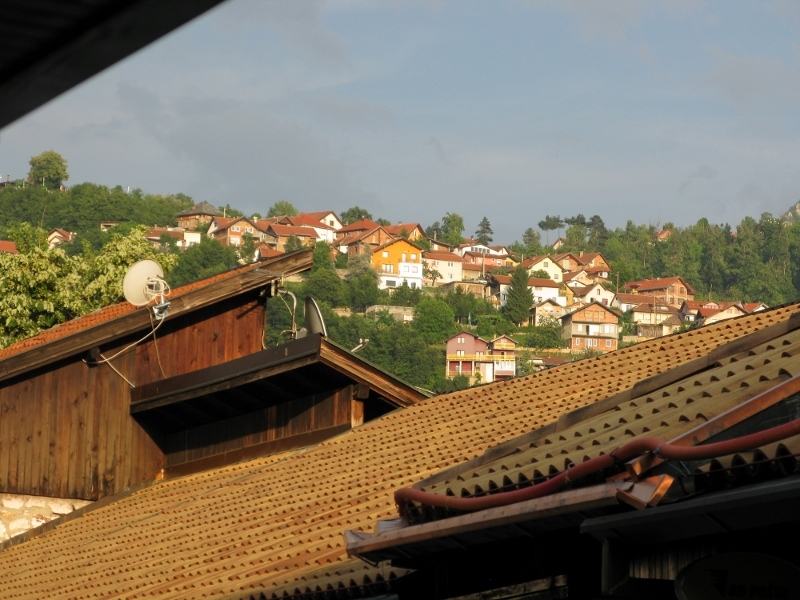 But when in Rome – or Sarajevo – I did as the locals do. And, as years of conditioning condensed and melted away, I found myself enjoying the experience. Sunday night. 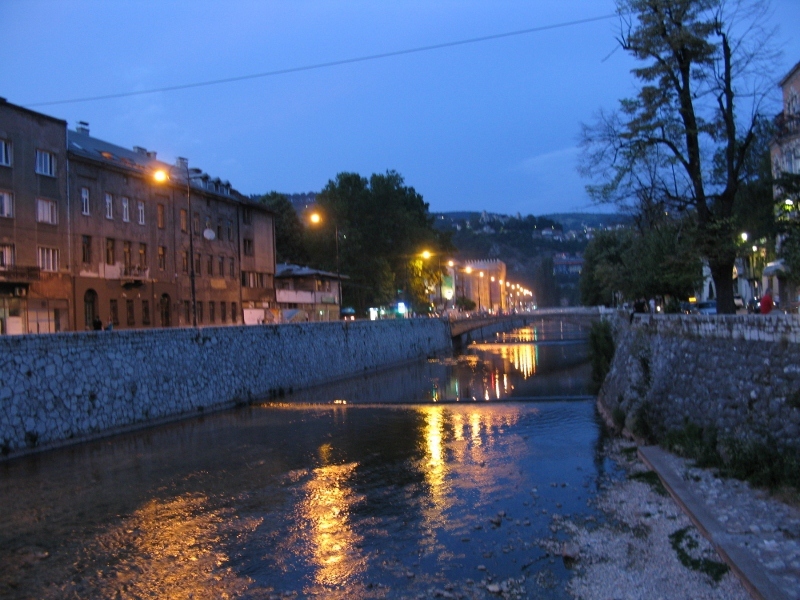 Sarajevo. Dinner. The restaurant was already booked by our hosts – we had an address and a taxi and assurances that our table would have full view of the TV. 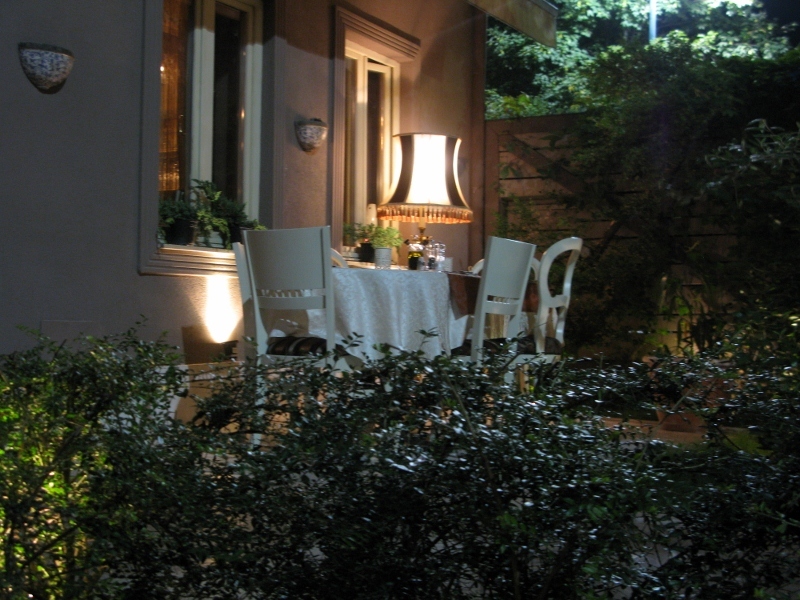 Yes, our hosts were Italian and Euro2012 was being its usual pervasive self. As we wound our way up the hill, the city fell behind us and the air became noticeably cooler. I had no idea what to expect – no concept of what posh restaurants might look like in Sarajevo or even what the menu might offer. 4 Sobe Gospode Safije is what’s called a fusion restaurant. 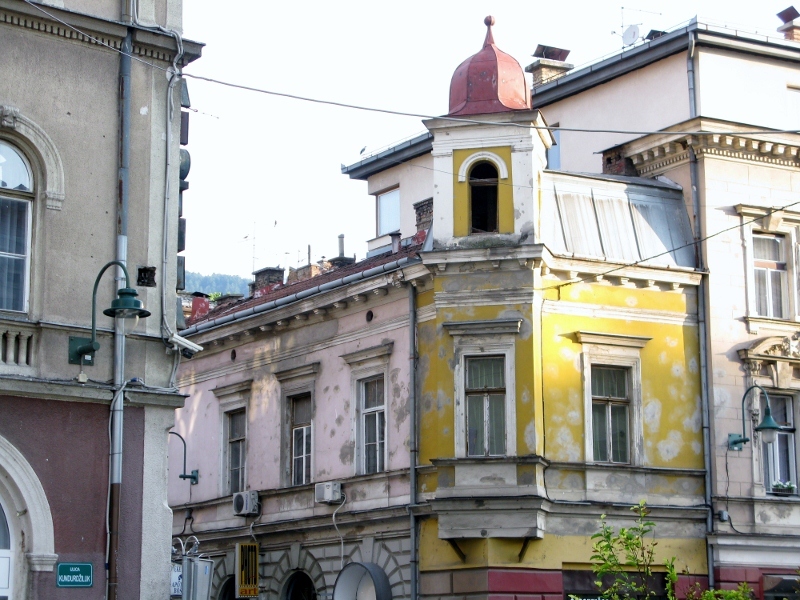 Situated on three floors of an original 1910 Austro-Hungarian house set just outside the centre, the restaurant is based on a love-story between the Bosnian Safija and Johan, her Austrian lover during the transition from Turkish to Austro-Hungarian rule. Safija, a woman of remarkable beauty, was only daughter of Ahmed-Bey Magbulija. She dressed to embolden her beauty and loved to walk the old streets of the city. Some approved; others didn’t. 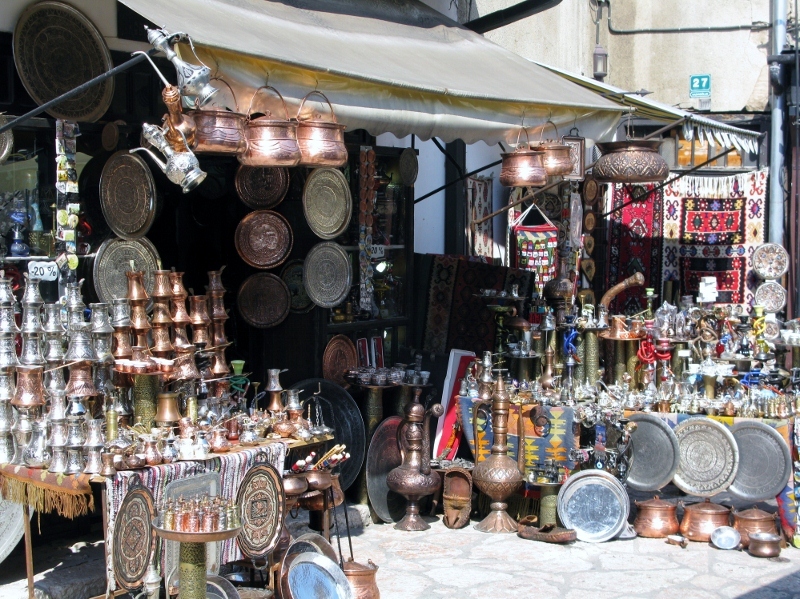 Safija understood that times were changing but many in the city were not ready to let go of the past. She dreamed of a man with golden hair – an Austrian – who helped her to her feet when she fell. It was 1914. 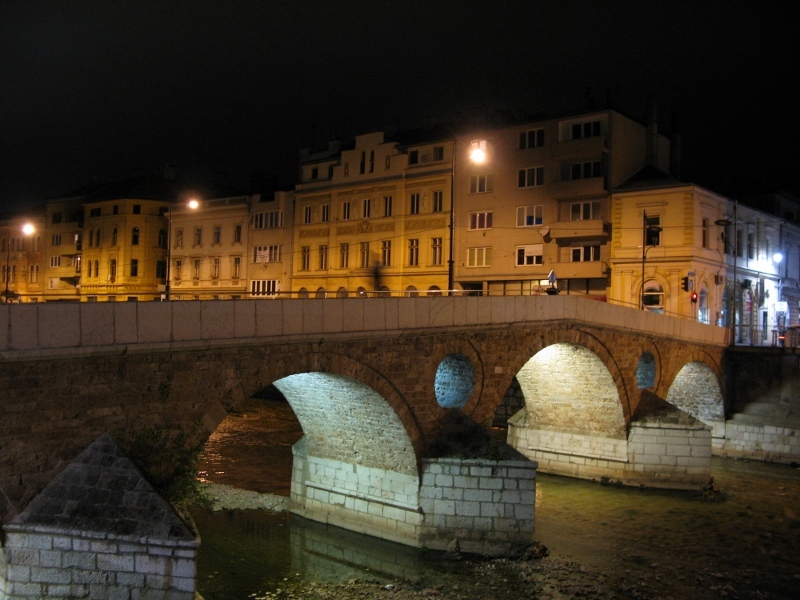 The city was agog with activity in preparation for the visit of the Archduke Ferdinand. Safija went to watch. New carriages had appeared in the town, beautifully painted and carrying ladies in long light colored dresses and jeweled headbands garlanded with flowers … Safija had never seen anything like it in her life. The ladies were accompanied by gentlemen dressed in black, without belts or waistcoats. Their white shirts were fastened at the neck in a strange way and they had polished shoes. On their heads they wore a different kind of fez Safija knew that it was called a hat. She knew too that the ladies’ headbands were called tiaras. And the she saw him. The man in her dream. Baron Von Herberstein. He later came to call on her parents, along with his two sisters. A friendship ensued and the Baron fell in love. But Safija ignored his entreaties. They came from two different worlds and she couldn’t cross that divide. 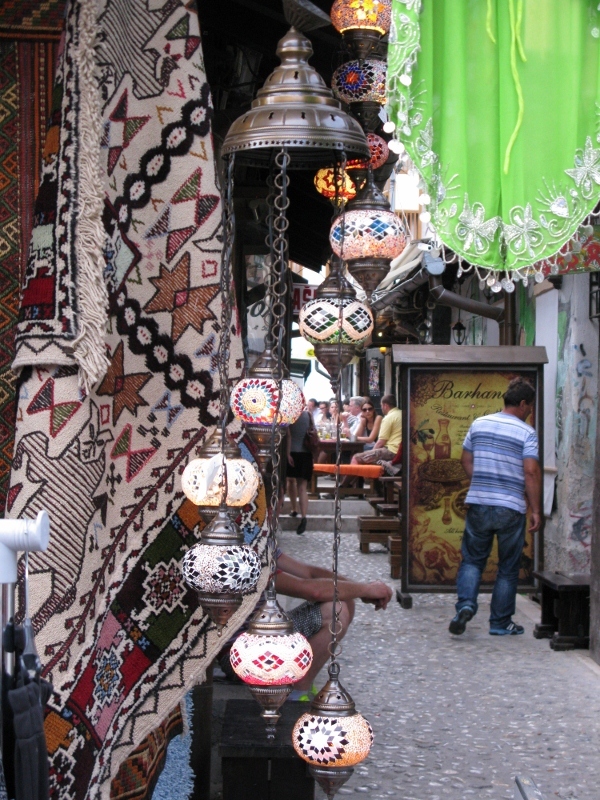 He arranged with his sisters to invite Safija on a walk to the Old Town and to wait for him to join them. It all went to plan. One minute the sisters were there, the next they’d been replaced by the Baron. He professed his love and asked her to run away with him. I have been looking at you for a month; I have followed your shadow; you have burned my heart more deeply than the sun. I have called to you in my dreams; I have called you my own. You are not destined to live or die here. We will run away … far away from everything. I will give my life if need be to fulfill your desires. I will build you a paradise … a house with four rooms and each one of I will sprinkle with silver and gold. Everyone will know that you are my queen … a bird of paradise.But Safija didn’t know what to do. How could she tell her parents that she was in love with a Christian. If her father knew they were alone, he would have them killed. But when the Baron took her in his arms and kissed her, she knew that she was prepared to shame her religion, lose her reputation, destroy her father; she was prepared to die. She knew she was guilty, and yet not guilty. She loved … not an Omer-Bey or an Adem-Bey or anyone she had been meant to marry. She knew she loved Johan Von Herberstein. She asked him to dig their graves. She said she would rather have him hang her than her father. 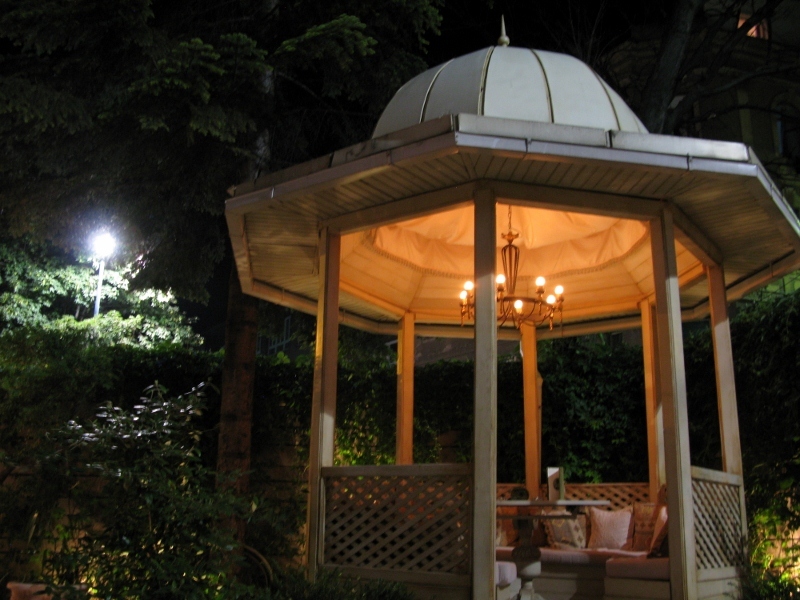 As we sat in the garden of the restaurant, it wasn’t difficult to imagine the love story. The menus showed old photos of Safija and Johan. The food was excellent. The wine superb. A beautiful atmosphere. 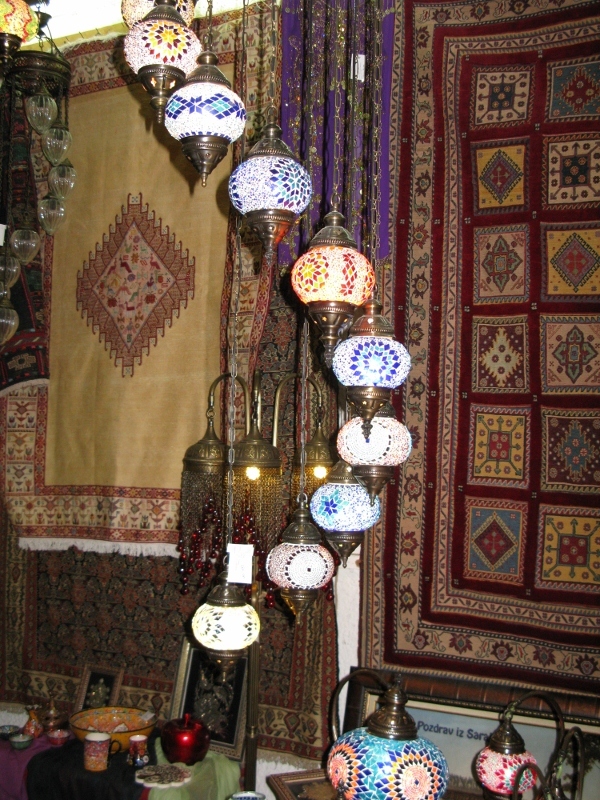 If you’re ever in Sarajevo, make sure you drop by. 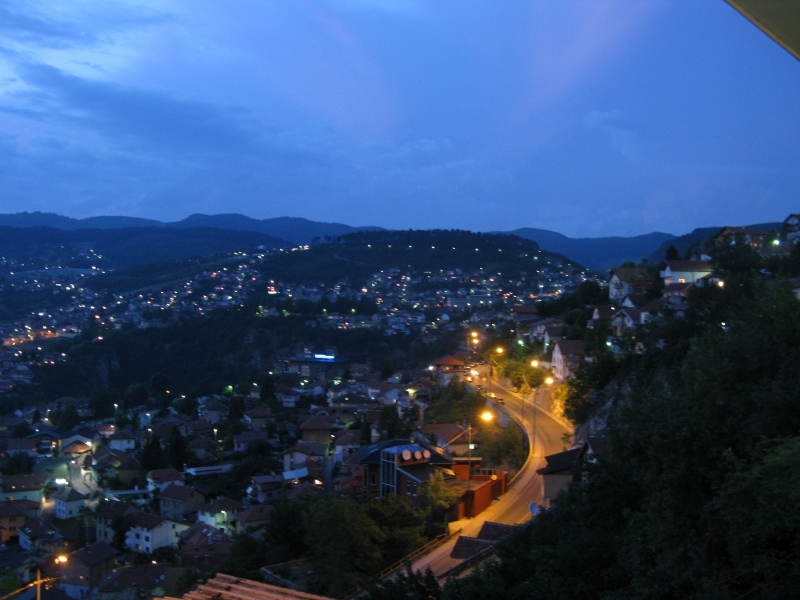 Čekaluša 61, 71000 Sarajevo, BiH. It’s open from 9am to midnight.